February 16th, 2016, Charlottetown – P.E.I. short-track speed skaters picked up nine medals and a trio of new provincial records at the Atlantic Canadian Short Track Championships held recently in Dieppe, New Brunswick. The Island team’s medal haul included four gold medals in the competition which featured 188 skaters from 12 clubs across Atlantic Canada and Quebec. Matthew McKenna won one of four gold medals for P.E.I. at the recent Atlantic Canadian Short Track Championships in Dieppe, N.B. The Island team picked up a total of nine medals at the event. Photo courtesy of Kristen Binns. Stepping to the top of the podium for P.E.I. were Eliana Monthony in division 6, Jenna Larter in division 8, Carter Bruce in division 8 and Matthew McKenna in division 9. Monthony posted a pair of personal best (PB) times enroute to her third medal and first gold of the season. Larter nabbed her third gold medal in as many outings this season, once again demonstrating her prowess in the sprint distances. Bruce earned his third gold medal among four podium finishes so far this season, while McKenna earned his first medal of the season after posting three PB times. Taking silver for the Island squad were Stratford skaters Andrew Binns in division 6 and Addison Bruce in division 10. Binns improved on his own provincial record time for 12 year-old boys in the 400 metre distance on his way to the medal, while Bruce grabbed his first medal of the season after a pair of PBs. Bronze medal winners were Carly Connell in division 2, Rob Binns in division 2 and Kristen Binns in division 7. For Connell, the event marked a successful return to competition after knee surgery last summer. Rob Binns bettered his provincial record time in the 500 metre distance for masters (40+) skaters, while Kristen Binns notched new PB times in her sprint distances enroute to her fourth podium finish of the season. Also a highlight among Island performances in Dieppe, Matt Kozma of Charlottetown set a new provincial record by improving on Zach Moran’s 2012 standard for 14 year-old boys in the 1500 metre distance. Kozma, Monthony, Andrew Binns, Kyle Connell, Thomas McQuaid and William Lyons of the Eastern Kings Speed Skating Club comprised a strong Island contingent that controlled many races in a fast division 6. P.E.I. coach Sarah Taylor said that the Island team had one of its best outings of the season. “Our skaters are always up for this meet and for the chance to skate on the Olympic ice as part of a big Island team. They’ve trained hard these past couple of months and were rewarded with great performances and personal best times that they’ll build on for the last competitions of the season,” said Taylor. The fastest P.E.I. 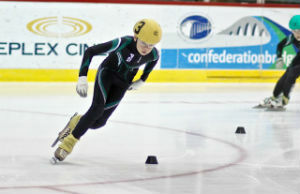 skaters in the event were Charlottetown siblings Peter and Andrew McQuaid, who placed fourth and fifth, respectively, in division 1. The McQuaids and Carly Connell have qualified for and are now looking ahead to the Canadian Junior Open Selections #2 meet to be held in Fredericton in March. Also representing P.E.I. in Dieppe were Mia Stewart, Liam Chatfield, Daniel MacKinnon, Simon Hale, Alex Rogers, Anderson Arseneau, Zachary Chatfield, Olivia Wood, Jane Bruce and Dennis O’Shea. Roger Fulton of Fredericton claimed the top overall position in the meet, followed by Seamus Smith of the St. Croix Blades and Tyler Magee of Saint John, while Rikki Doak of Fredericton, followed by Courtney Sarault of the host Codiac Cyclones and Sarah Gilbert of Fredericton took the top three spots among female skaters. The last Atlantic regional short-track meet of the season will be held in Halifax in early March, giving Atlantic skaters a final opportunity to earn berths in the Canada East Short Track Championships presented by Irving Oil, to be held in Charlottetown on March 26 and 27. The Canada East event will see the Eastlink Centre play host to the top 11 to 15 year-old speed skaters from Ontario, Quebec, the Atlantic Provinces and Nunavut.